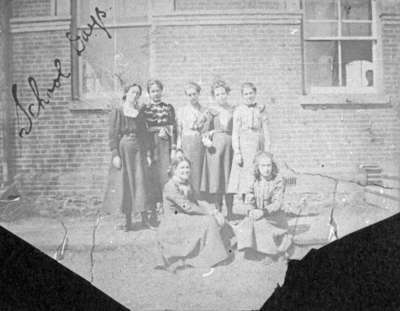 A black and white photograph of a group of seven unidentified female students outside the Whitby Collegiate Institute. The Whitby Collegiate Institute was built in 1872-1873 at the south east corner of Colborne Street and King Street. The building was demolished in 1975-1976.